In the main dining room, Chef/Owner Chad Scothorn offers fine dining with generous portions and outstanding ingredients. His seasonal menu offers diverse cuisines, including French, American and Thai. Though the overall approach is "fusion," you'll never find crossed cultures on one plate. 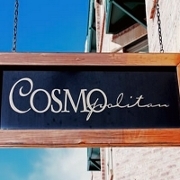 No matter what you order, the Cosmo has the perfect complementary wine. Choose from over 200 selections from all over the world. Our main dining area is available by reservation only. Located at the At Oak Street Gondola in the Hotel Columbia.